Complacency could cost you dearly. In order to maintain and build competitive advantage, you must constantly keep across what’s happening in your industry or market. This is the ongoing rationale of nem's cama process, understanding your competitive advantage within sector/market attractiveness. Businesses are continually competing and changing to provide better, faster and different offerings to their target markets (competitive advantages). The values and interests of customers also change as they age. Lifestyle has become increasingly important amongst all consumers, and new technology is the order of the day. Failure to improve and innovate will see any business fail in just a few short years. The rising costs of doing business mean that any small drop in turnover can result in a profitability plummet. It’s a tough marketplace out there. Big, stable businesses and even whole industries can effectively be wiped out by not acting quickly enough when their marketplace changes (market attractiveness). Strategic planning utilising methodology like cama to direct longer-term thinking are now essential practices for business survival. Michael Porter of Harvard University identifies five major forces impacting a market: Potential Entrants, Suppliers, Substitutes, Customers, and Industry Rivals and Competitors . You of course need to know a range of information about your Suppliers, Customers, and Industry Rivals and Competitors. Equally critical but often overlooked is the need to understand market forces relating to Potential Entrants and Substitutes. This impacts both your competitive advantage and market attractiveness (cama) metrics. Ideally you should monitor industry information around turnover, profitability, new products, discontinued products, businesses (or product lines) being bought and sold, major personnel changes, and commentary from experts. Especially seek information on potential threats from newcomers. Become familiar with the estimated size of your market, your share of the market, your largest competitors’ share of the market, and trends in market growth and decline. Also attempt to identify where your industry sits within the business cycle, i.e. how mature your industry is. Understand the barriers that exist to entering your market. Some of these are government controlled and may need to be lobbied for change – such as with pharmacies, news-agencies and taxi services. Other barriers might involve agency licensing, agreements with suppliers, or be subject to negotiation or performance evaluation. Barriers could also include substantial investment required to start a new business or line (Capital Intensity), which will be easier when interest rates are low . If any of your suppliers, customers or competitors are listed public companies, you can access their Stock Exchange Announcements and Annual Reports, including detailed financial data. Some financial data – such as percentage profit and loss breakdowns, employee productivity, turnover per square metre, etc. – can help you benchmark your performance against competitors and industry standards. 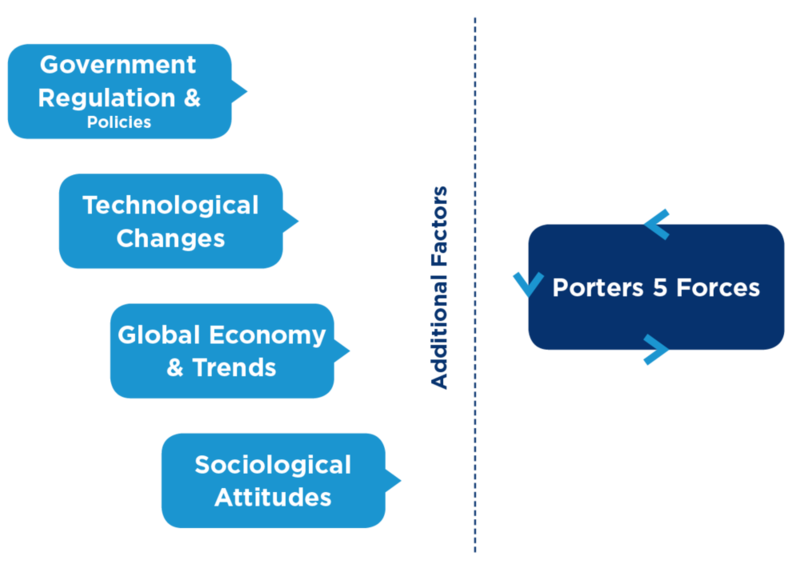 The business environment in which Porter’s 5 forces operate include four additional factors that can affect your market: Government Regulation and Policies, Technological Changes, Global Economy and Trends, and Sociological Attitudes. Specific examples that might have a serious impact on your business include Interest Rates, Inflation Rates, Global Exchange Rates, Wage Rates, Changes in Taxation, Rental Returns (property prices), Reducing Costs of IT Hardware and Software, Raw Materials and Commodities Price Changes, and Insurance Costs. Global trends such as outsourcing of financial and IT services to India, shifting of manufacturing jobs to China, the speed of the internet and growth of online shopping, global warming (droughts) and the US “war on terrorism” can also impact some businesses. Generate new business prospects in areas such as safety, environment and training. Why Use a Financial Intermediary?